Eidos Montreal's Jean-Francois Dugas and Jonathan Jacques-Belletete hit the stage at the PC Gaming Show last night to talk about the upcoming Deus Ex: Mankind Divided, and to show off the capabilities of the Dawn Engine that's powering the game. 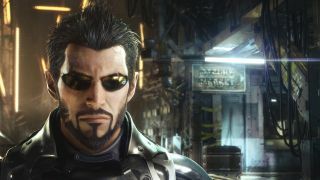 Technology aside, one of the more interesting things they talked about is how expectations, and pressure on the studio, have changed following the success of Deus Ex: Human Revolution. "The first time, when we started to work on this title, a lot of you guys were were looking at us and [saying], 'Please, like, let's make sure that you guys do a good job.' So the pressure was really all about making sure that we were living up to you guys," Dugas said. "Today, now that we did Human Revolution and it was an appreciated game, now people are having a lot of high expectations." But the technological part of the presentation was very cool too. The video accompanying the interview highlights some of the new technology at use in the Dawn Engine, and then kicks over to some proper gameplay bits that demonstrate a few of Adam Jensen's new stealth abilities, and his usefulness in a stand-up fight as well. Deus Ex: Mankind Divided will be out in early 2016.